An epic high-altitude trek through one of the world's last truly remote areas. Overall a fantastic trip, great staff, wonderful place. This splendid trek is one for the true mountain enthusiast, and if you are looking for something truly remote, with some of the most awesome mountain scenery in the world, then this is it! The Karakoram contains the greatest concentration of glacial systems outside Antarctica. This superb trek crosses the Biafo-Hispar glaciers from end to end - the longest glacial system within the Karakoram at 116km. Where the two glaciers meet lies Snow Lake, encircled by many unexplored and unnamed peaks, and we have allowed a full day in the itinerary to explore this spectacular spot. Your expedition starts with the flight to Skardu, the gateway for many treks and expeditions on their way to the peaks of the area - K2, Broad Peak, Gasherbrum and the Masherbrums among others. From Skardu you drive as far as you can to reach Askole, the trek start point. This road is prone to landslides so you may have to walk part of the way. Meeting your porters and trek crew you will set off, following the beginnings of the trail to K2 Base Camp before breaking left after just 10km to trek up the Biafo Glacier. This glacier is 63km long and descends from the central peaks of the Karakoram, flowing east into the Braldu Valley. The Biafo glacier is dominated on either side by magnificent granite spires and peaks up to 7,315m/24,000ft high. After six days of trekking you reach Snow Lake and have time to explore before your crossing of the Hispar La, 5,151m/16,900ft, just east of Snow Lake. This region is thought to be a last stronghold for many animals, including Himalayan bear, ibex and the snow leopard. After crossing the pass there follows a long, gradual descent to Hunza, through equally staggering scenery. On trek you will have a highly experienced western guide, supported by a local guide and trek crew. They will provide an excellent standard of service and a first rate camping experience ensuring that you eat well, sleep well and only need to focus on enjoying your incredible surrounds. This is truly a trek for aficionados of tough, spectacular, high mountain trekking. Meal arrangements: 21 Breakfasts, 19 Lunches, 19 Dinners. Fly to Islamabad and on to Skardu. Drive to roadhead at Askole. Start with trek to Namla and then on trek ending at Hispar village. Drive to Karimabad and explore in Karimabad. Drive to Duiker. Tony was our Operations Manager for a few years in the 1990s, and thus has an in-depth knowledge of the business. Since leaving he has continued to lead treks for us regularly, and maintains close contact with us despite now living in Asia, where he continues to find new routes in countries as diversified as New Zealand, Australia, Taiwan and the Philippines. Tony is a very active runner and tri-athlete and an excellent organiser and thus a popular leader. 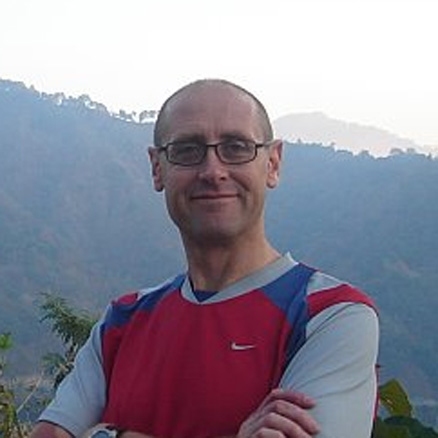 As well as travelling independently through Asia, Tony has led numerous treks for us in Bhutan, Tibet, Sikkim, Ladakh, Zanskar and Nepal. Today you will depart on an overnight flight to Islamabad. Day 2 - Arrive Islamabad. Fly to Skardu, 2,499m/8,202ft, or drive from Islamabad to Chillas. You will arrive into Islamabad early in the morning and after clearing immigration formalities you will be met by our agents and taken to a café in the airport for breakfast. You will then have around an hour to relax before you need to check in for your spectacular flight to Skardu. The flights to Skardu are weather dependent and if the flight doesn't operate today, you will drive to Skardu instead. As the drive takes two days the itinerary will be pushed back a day, with the extra day being made up later on in the trek. Skardu town is located at the confluence of the Indus river (which rises in Tibet near Mount Kailash) and the Shigar River and is surrounded by grey-brown coloured mountains which obscure views of the 8,000m/26,247ft peaks of the nearby Karakoram range. Skardu will seem pleasantly cool after the heat of Islamabad. It is a fascinating village with a long street of shops, a medieval fort and a polo ground. In the bazaar you could buy one of the local costumes, a Salwar Kameez, which are very cool for trekking. You could also visit the 8th century seven storied Khorpocho Fort. Note: If the flight to Skardu is cancelled today you will drive the rugged Karakorum Highway up to Chillas. The drive would be around 12 hours and takes you from the lush green foothills and up through steep-sided gorges where the occasional landslide may delay matters! In Chillas you will stay at the Panorama Hotel or the Shangri La Hotel - both decent tourist class hotels. Day 3 - Free day In Skardu. Alternatively drive from Chillas to Skardu. If your flight to Skardu went ahead as planned yesterday, you will have a free day in Skardu today. Alternatively, if you have had to drive from Islamabad then today you will continue the road journey to Skardu, some 8-9 hours of driving taking you through magnificent gorges with some excellent views of Nanga Parbat 26,657ft/8,125m. The further up you go the more the river is a raging muddy torrent. Eventually you emerge on to a wide river plain with small villages, looking like oases, and continue to Skardu. You will make up the time you have lost later in the itinerary. Day 4 - Drive to roadhead at Tongul or Askole, 3,000m/9,843ft - 6-7 hours. Today you will make the exciting drive to the trek start point. Firstly you drive through the wheat fields and apricot trees of the Shigar valley. The jeep road has now been extended as far as Askole, forging its way through the spectacular steep-sided Braldu Gorge. The road crosses the Braldu River three times and passes through several villages en route. This road is prone to landslides and it is possible you may have to start walking earlier than Askole. Tonight you will camp either in a grove of trees in Tongul or continue to Askole, the last village on this trek. Askole is an absolutely beautiful place with green terraced fields in a wide valley flanked by minor snow peaks. Tomorrow you will start your trek into the heart of the greatest accumulation of ice outside the polar regions. Day 5 - Trek to Namla, 11,699ft/3,566m - 6-7 hours. Today you start your trek. You walk through Askole, leaving behind human habitation, and turn west onto the Biafo Glacier at a point about 10km east of Askole. You will take lunch before a short ascent is made over a shoulder to gain the left moraine and descend, first on to the moraine covered glacier, and then back on to the left bank to a grassy camping site known as Namla. You will have good views of the pyramidal Baakhor Das Peak. Your porters may sing and dance in the evening - a favourite pastime of Balti porters. Day 6 - Trek to Mango, 11,939ft/3,639m - 5 hours. Today you have a relatively short and moderate day on the glacier. Initially you have to climb through a jumble of ice and rubble to reach the flat, dry ice in the centre of the glacier where the going is easier and views of ever more spectacular granite peaks draw closer. Ahead are the three peaks of Latok I, II and III, all around 7,000m/22,966ft. You camp overnight on the left bank of the Biafo, on an excellent grassy site. Day 7 - Trek to Baintha, 4,000m/13,124ft - 6-7 hours. This is a lovely easy day's walking. Firstly you pass a small lake then head out across the lateral crevasses to the smooth white centre of the Biafo Glacier. Ahead is your first view of the Hispar La. The serrated mountain walls on either side rise to 6,000m/19,686ft. You cross two medial moraines and climb the lateral moraine to find a green ablation valley which you follow up to Baintha, a grassy area with willows and a clear stream. You are now near the junction of the Biafo-Baintha Glaciers and great pointed granite peaks march off into the distance. Baintha is also known as Conway's Camp. Day 8 - Rest day and acclimatisation day in Baintha. This is an opportunity for your hard-working porters to rest and prepare food for the future trek days and for you to wash clothes and relax. You may also explore up a side valley for fantastic views of the Ogre 23,901ft/7,285m and the Latok Peaks group. Tonight there will doubtless be opportunities to join your porters in some singing and dancing. Day 9 - Trek to Morfogoro, 14,852ft/4,410m - 5-6 hours. Today you will start by ascending the steep and loose trail to get onto the glacier however, once there you will follow the flat glacier making for relatively straightforward walking. Further along the glacier there are some crevasses to be aware of where, depending on the conditions, you may have to rope up to safeguard your passage. There are superb views of many peaks including the Ogre, 7,813m/25,633ft, and also you will get your first glimpses of the Hispar La and Snow Lake. Day 10 - Trek to Karpogoro, 15,354ft/4,680m - 5-6 hours. Today's walk will see you reach Karpogro, trekking for the day across the Biafo Glacier with its many small crevasses. The Biafo is hemmed in by gleaming glaciers on the south and jagged granite on the north giving another day of breathtaking scenery to enjoy. For tonight's campsite there are two possible options. Napina is a green campsite in the northern ablation valley - it has fresh water but no bushes. If you don't wish to detour into Napina, you can camp out on the ice in the middle of Biafo at about 4,400m14,436ft, and your porters will collect water from glacier melt. Day 11 - Trek to Snow Lake Hispar La Base Camp, 4,770m/14,665ft - 6-7 hours. The way is marked by poles on snow-covered ice (rope essential, gaiters recommended), zigzagging to cross the crevasses but keeping slightly right of centre. Snowy peaks adrip with glaciers wall you in on the south, as do granite towers on the north. At the intersection with the Sim Gang Glacier and Snow Lake (Lukpe Lawo), the route to the Hispar Pass leads off to the west. The ice here is about 1.5km thick and flowing at about 300m a year. You will camp at about 4,780m/15,682ft in a flat bowl of ice several kilometres wide and surrounded by jagged black and white mountains. (From here there are treks which lead north across Snow Lake and the Khurdopin pass, 5,790m/18,996ft to the Shimshal valley). The name Snow Lake was given in 1892 by W Martin Conway, the first foreign visitor. In 1899, the husband and wife team of William Hunter Workman and Fanny Bullock Workman came and speculated that Snow Lake might be an ice-cap like those in the polar region, from which glaciers flowed out in all directions, and they estimated its size at 300 square miles (777 square kilometres). The night sky here is unforgettable as is sunrise or sunset! Watch out for Yeti footprints - Tilman saw some here in 1939. Day 12 - Rest day and exploration around Hispar La. You will have a free day to explore and really take in this beautiful area. If you have camped below the pass you will have time to climb to the pass for fabulous all round views and also to perhaps climb a little further for even more far-reaching vistas. If the weather and conditions are good, your guide may advise making the crossing of the Hispar La to Khani Basha today and having a rest day tomorrow instead. Day 13 - Cross the Hispar La and descend to Khani Basa, 16,899ft/5,151m – 7-8 hours. You will rise early to be able to drop from the snow-covered Hispar La, 5,151m/16,899ft, before the snow becomes too soft. It takes just two hours to struggle up to the flat pass. Nowhere is the ascent particularly steep, but the altitude will have a telling effect. Naturally, as you gain height you will obtain an incredible panorama of the region - on one side the entire Snow Lake area and its surrounding peaks, the Biafo Glacier and its tributaries, while on the other side you will start to see the countless peaks of the Hispar side towards Hunza. Care will need to be taken as there are large crevasses in this area. Trekking under the shadow of the Tah Rutum and Balchish groups of mountains, you descend to just before the junction with the Khani Basa Glacier where there is a small green campsite. The scenery on this side of the pass is in complete contrast to the Biafo side. The peaks are much closer, black and white and rock and ice, as opposed to the golden granite of the early days of the trek. In a way they are even more impressive. There are good views of the white wall of the Balchish range from camp. Day 14 - Trek to Yutmaru, 14,206ft/4,330m - 4-5 hours. Another wonderful day. Perhaps the clouds will be sticking like cotton wool to the peaks and hanging in layers down the valley. The peaks are so close on the other side that a shout will echo back to you. It takes about 1½ hours to cross the Khani Basa glacier, a heaving mass of rubble, where it is relatively easy going with a fine view north to the smooth white dome of Kanjut Sar at 7,760m/25,460ft. The trail then follows along the lateral moraine above the glacier with magnificent views across to the hanging glaciers and frequent avalanches on the southern ice wall. Every time there is a glacier crossing your porters will probably have a loud prayer session! Your overnight campsite is a pleasant grassy spot with willow trees and flowers not far from the Yutmaru Glacier. Day 15 - Trek to Shiqam Baris, 3,660m/12,008ft - 7-8 hours. After an hour or so you descend to the side glacier, which again will take an hour or two to cross. There is a horribly steep bank on the other side. Having gained the parallel valleys again the walking is great. There are views of Khunyang Chhish, 25,764ft/7,853m, from the side glacier. In some years groups have in fact camped almost opposite the Makrong Glacier. There are several options for your overnight camp here including Shiqam Baris. Day 16 - Trek to Bitanmal, 3,760m/12,008ft - 6-7 hours. Today's walk will start similarly to that of the preivous day and, after an hour, you will again descend down a steep bank to cross another side glacier returning to the parallel valley. Tonight's camp at Bitanmal is in a large meadow often used by herders from Hispar village. Day 17 - Trek to Hispar Village, 7,552ft/2,302m - 6-7 hours. Before too long you will hit the newly-made jeep trail that descends to Hispar village. There you cross a suspension bridge above the boiling river of liquid mud. The inhabitants of Hispar are a colourful and friendly tribe who are followers of Prince Karim, the Aga Khan. You have now left the Hispar Glacier behind and the relief of seeing blossoming fruit orchards and multi-terraced fields will be quite a shock to the system as will be seeing houses and villagers! Your overnight camp will probably be an hour or so beyond the village and lower down by a spring next to the road. Day 18 - Drive to Karimabad, 2,440m/8,005ft - 48km, 2 hours. Visit Altit and Baltit forts. Today you will drive to Karimabad, the capital of the Hunza region. Depending on the state of the road to Hispar you may still have a 2½-3 hours walk to reach Hunza where the vehicles will meet you. The last 30 minutes are the sting in the tail! You can stop off to explore some of the many small hamlets of the Nagar Valley on your way to Karimabad. The drive to Karimabad takes about 2 hours. The small kingdom of Hunza remained isolated mainly because it is contained within unbelievably steep gorges. A legend exists, common to many parts of the western Himalaya, that the Hunzakuts (as the people of Hunza are known), are the descendants of the five lost soldiers of the army of Alexander the Great. The people are cheerful, friendly and are fair-skinned with blue or green eyes. The kingdom remained isolated until the British took over in 1891 and it became part of Pakistan and the same family has ruled Hunza's 35,000 inhabitants since the 11th century. The people of Hunza were at one time a very war-like people and well known for plundering caravans, slave-trading and attacking their neighbours. It was the arrival of the Karakoram Highway which really linked them to the rest of the world. The people of Hunza are renowned for their longevity supposedly resulting from their mostly vegetarian diet of cereals and fruits, especially the apricots for which the region is famous. Almost the entire population belongs to the Ismaili Shia sect, headed by the Aga Khan. The women wear bright clothes, long skirts with baggy trousers and little embroidered pillbox hats over which they drape their shawls. Hunza is outstandingly beautiful and there is plenty to see before you leave Karimabad, such as the 400-year-old forts of Altit and Baltit. The latter fort is said to have been made by a princess who married the reigning Mir and brought with her from Baltistan the masons, carpenters and craftsmen who built the fort as part of her dowry. It is a curious rambling old palace with 53 rooms on 3 storeys. There is a museum here which is worth seeing. The Altit fort is even more impressive and is probably 100 years older. The bazaars are worth a look round and don't forget to try the local apricots. There are also lovely walks above the town. From the Hunza valley there are panoramic views of Rakaposhi 7,788m/25,551ft, Diran Peak 7,266m/23,838ft, Spantik Peak 7,027m/23,054ft, Ultar 7,388m/24,238ft and Lady Finger 6,000m/19,685ft. Day 19 - Drive to Duiker. Sightseeing. This mornining you will make the short drive from Karimabad to Duiker. Duiker is a charming hamlet above the village of Altit which is situated next to Baltit, One of the main attractions of Duikar is the viewpoint, 2,900 m/9,514ft. Here you have the best views during sunrise and sunset After arriving you will be transferred to your hotel, and enjoy some refreshments. You will then walk up to Duiker Top (called haven of earth) here you will have a panoramic view of the entire Hunza Valley with several surrounding snowcapped mountains above 7,000m/22,966ft . Later you will hike to visit Holy Shrines near the Shahabad valley. Day 20 - Drive to Gilgit, 1,523m/5,000ft - 110km, 2 hours. It is a beautiful drive to Gilgit, though the way can be bedevilled by landslides. On the way you will get great views of Rakaposhi. Gilgit is a thriving frontier town with a population of over 40,000. The small old town is quaint and has a cluster of interesting places to visit within a short radius. This includes a beautiful rock carving of Buddha, a 700-year-old monument to Taj Mughal and the longest suspension bridge in Asia, 600ft long. The favourite sport in Gilgit is polo, which the locals claim originated here. Also worth hunting for is the old colonial graveyard to see the grave of George Hayward who played an important part in the Great Game and early exploration of the area before being murdered by local tribesmen. Gilgit Bazaar is also famous for its handicrafts and you may find this a good place to do some shopping. Day 21 - Fly to Islamabad. You will transfer to the airport for the one hour flight to Islamabad with magnificent views of the Karakoram. This flight for instance takes you right past Nanga Parbat. On arrival in Islamabad you will be transferred back to your hotel. The rest of the day will be at leisure. Note: If the flight from Gilgit is cancelled you will drive back to Islamabad instead which takes two days - there is time to allow for this possibility. If you do drive the overnight stop would be at Besham, where you would stay at the Besham Continental or the PTDC Motel. Day 22 - At leisure in Islamabad or optional excursion to Taxila. Evening group transfer to airport for flight home. Today you will have the option to explore Islamabad at your own pace, or you can choose to take a guided tour of Taxila. This optional excursion needs to be paid for directly to our agent when in Islamabad. Please contact our office for prices. Most of the archaeological sites of Taxila (600 BC to 500 AD) are located around Taxila Museum. For over one thousand years Taxila was famous as a centre of learning the Gandhara art of sculpture, architecture and Buddhism. There are over 50 archaeological sites scattered in a radius of 30km around Taxila. You can visit the archaeological sites of Jaulian, Mohra Moradu and Sirkap. There is also the option to visit Taxila Museum, housing the rich archaeological finds of Taxila. It is one of the best and well maintained site museums in Pakistan. If time permits you will also be able to visit Sirkap Sirkap, an archaeological site on the bank opposite the city of Taxila built by the Greco-Bactrian king Demetrius and his son Stultus around 180 BC. After your visit to Taxila you will be transferred back to Islamabad in time for your international flight home. Note: If your flight from Gilgit is cancelled due to bad weather, this day can be used to complete the drive back to Islamabad. Day 23 - Overnight flight to London. The generally warm, dry conditions and the long days of sunshine are powerful client recruiting factors, along with perhaps the world's most dramatic ice-snow-rock mountain scenery ... this is the true 'Roof of the World' as Tibet or Nepal have nothing this extensive and this high. Northern Pakistan is a world apart culturally, religiously and security-wise from the Afghan/Pakistan border areas. A great trek!